Let’s start from the very top, where the northernmost region of Lapland is located. Known as the home for the one and only real Santa Claus, Lapland invites you to experience the authentic arctic life. Rovaniemi, Ivalo and Inar are the most popular places in Lapland offering an astounding variety of tourist attractions. 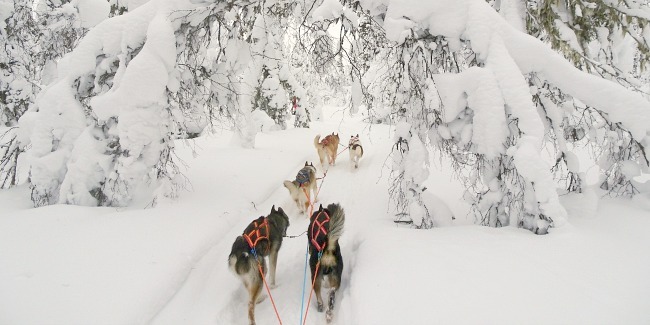 Feel the beauty of Northern nature on a snowmobile safari, reindeer or husky ride. Plunge into the spirit of Christmas in Santa Claus village and Snowman world. Feel like the real Lappish while staying in the Kakslauttanen Glass Igloo Resort admiring the Northern lights dance in the clear night skies. Visit the Sami Museum to learn more about the people and nature of Northern Lapland. Let’s move a bit to the South. Lakeland is all about experiencing a real Finnish identity. It is the central part of Finland where glittering lakes cover most of the peaceful landscape. Apart from awe-inspiring natural beauty this is the place where the great tradition of Finnish Saunas began. Boundless woods, clear lakes, fishing, boating, traditional sauna experience - Lakeland promises pure Finnish relaxation. Coast & Archipelago of Finland is yet another part of Finland worth your visit. Historical cities, harbor towns, lighthouses, and strong maritime culture are definitive traits of Finland’s 1100 km of coastline and the rocky archipelago. The easiest way to fall in love with the archipelago is the cruise From Turku - the oldest city of Finland - to cozy Loistokari Island. Archipelago cruise not only offers beautiful sceneries but also provides an opportunity to taste the finest samples of local cuisine. Helsinki region as well as the Capital city itself are all about cultural experiences. Design, architecture, culture and nature - there is no shortage of attractions here. Visit Kiasma Museum, one the most famous museums of modern art in Europe, as well beautiful Old Town and the famous Market Square where you can find traditional food, handicrafts and souvenirs. Want to feel the real spirit of the Old Town? Take a vintage tram dating back to 1909! Finland has something for everyone. From one-of-a-kind Northern Lights experience in the Finnish Lapland to culture touring in the capital - we will be happy to tailor your vacation in Finland.